With the ability to be used in cold or rainy weather, and the consistency of potting soil and lack of greasy cutback, this product is user-friendly for both the professional and the average homeowner. This cold patch can be applied in just a few simple steps. Sweep. 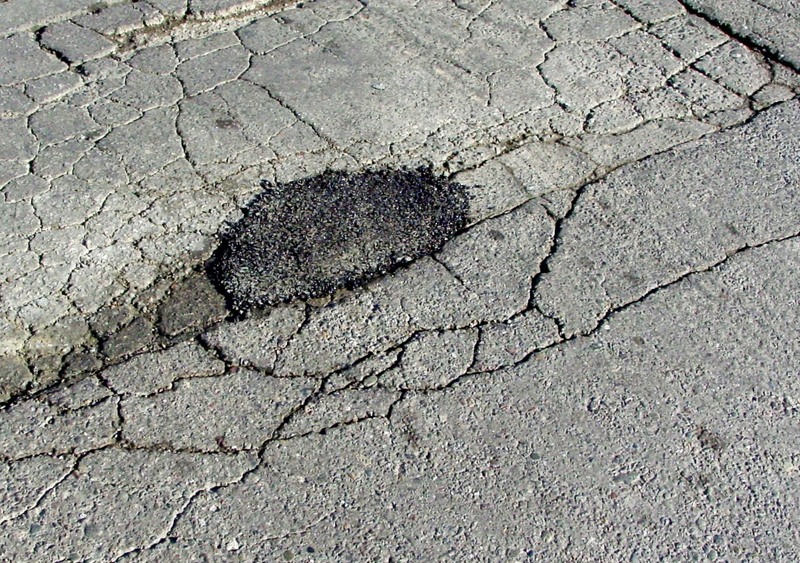 First, you need to make sure the crack or pothole you are repairing is dust, dirt and debris free. This can be done quickly with a broom or even a power washer. Pour. Next, you will pour the mix in 1 to 2 inch layers into the hole or crack. Make sure the mix is evenly spread. Compact. Once the material is evenly spread, you will need to compact. The cold patch cures during the compacting phase, so it is important for you to achieve as much compaction as possible. You can compact with tamper or you can use the tire of your vehicle by simply driving over the area a few times. It is important to note that if you are filling a hole that is more than 1 to 2 inches deep, you will repeat steps two and three until the hole is full. Filling too much at once can possibly lead to inadequate compaction. This cold patch can serve as a more cost efficient and time saving tool for a variety of applications. Filling potholes. Homeowners, business owners and professionals alike can apply this easy-to-use product to minor pothole damage for a quick, easy and less-messy fix. Filling large cracks.The patch can be used for filling in large cracks in driveways, pathways, or parking lots to keep the surface from further damage. Temporary paving for trench plates.The cold patch can be used to provide stabilization and paving where trench plates are used to help keep them from moving out of position. Temporary conform.The cold-patch is less expensive, less messy and much quicker than traditional asphalt making it ideal for temporary pavements. Small paving areas in cold or rainy conditions. .If you need to pave a small area, this cold patch does not force you to wait for better weather that traditional asphalt repair requires. Our all-weather cold patch is of superior quality than traditional cutback for a variety of reasons. The benefits to using this product include sustainability, convenience, cost-effectiveness and simplicity. Cold Patch Will Last Longer. Our all-weather cold patch will last longer than traditional cutback because it does not contain the petroleum-based softeners that make the end product too soft to be permanent. While the all-weather cold patch is considered temporary, it can withstand more time when compared to traditional cutback. Cold Patch Will Stay in Place Longer. The all-weather cold patch continues to cure as it is compacted, resulting in a longer lifespan. This product can also be covered with hot asphalt rather than having to be removed. Cold Patch is the Environmentally Preferable Choice. Because the petroleum-based product used in traditional cutbacks is known to evaporate as the asphalt cures, it is a much less sustainable product. The use of BoDean Co.’s all-weather cold patch is a more sustainable resource for patching because it does not contain the harmful petroleum-based softeners that traditional cold patch bears. Cold Patch Can be Used in Inclement Weather. The all-weather cold patch might provide the solution you need during cold inclement weather. Traditionally, asphalt repair is done in the fairest of weather conditions leaving colder, rainier months to further wreak havoc your pavement. Our all-weather cold patch can be used in nearly any weather condition thus making it much more convenient and cost-effective. Cold Patch Can be Stored. One of the main benefits to the use of the all-weather cold patch is the unique ability of the product to be stored by customers who may use it on-demand in nearly any setting. If you are in an area where you need to patch often due to heavy winds, rain or sun damage, you can store this in your garage and apply when needed! Are you ready to give this revolutionary product a try? This cold patch provides users with a unique ability for year-round repair while remaining focused on sustainability, quality and ease-of-use. Whatever your project may be, our expert consultants are waiting to answer any questions you may have. Please call us at (707) 576-8205 to speak with a BoDean Company specialist or click here to request a free online quote.